MANILA, Philippines — It was Atty. Ramoncita Reyes who represented the Rizal descendants during the sneak preview of Mirana Miranda’s video version of Ultimo Adios at Rizal Shrine, Fort Santiago Intramuros, Manila last 29 December. But Ms. Lisa Tinio Bayot, who seemed to be just another pretty face in the crowd, was sure that she had her fair share of immortalizing her lolo. On 19 January 2011, when we coincidentally turned 47, she started it all by collaborating with the Holy Angel University’s Juan D. Nepomuceno Center for Kapampangan Studies to create facebook rizal 150 to 150, a 150-day countdown to Jose Rizal’s 150th birth anniversary. Speaking of how great she is as the great granddaughter of Saturnina Rizal, our National Hero’s eldest sister who married Manuel Timoteo Hidalgo of Tanauan, Batangas! A draftsman and interior designer of her own Saturnina Development Corporation, Ms. Tinio Bayot exerted extra effort to further make Rizal more relevant to the Gen X, or Y, by teaming up with Trixie Herbosa Grau, the great granddaughter of Lucia Rizal, Maite Gallego, a descendant of Maximo Viola, together with Rosalyn Consing, Loi Ilustre, Miko Liwanag and Miles Po who are all members of Binhi English Literacy Foundation Inc.
On 28 May, she and Ms. Herbosa Grau led the slideshow presentation called Rizal as Young Hero for the Filipino Child at the Museo Pambata. And, on Rizal’s birthday itself, 19 June, they organized the Maligayang Bati Jose Rizal at the Fort Santiago. It was participated in by Cris Villonco, who sang Sinta ng Bayan, playing not Maria of Sound of Music but Maria Clara; Sipat Lawin Ensemble, a theater company composed of the Philippine High School for the Arts’s theater arts alumni; Heroes Square, another young theater group which performed a 30-minute play; Buhay na Kasaysayan whose actors wore military uniforms from different periods of Philippine history; Ateneo Chamber Singers, conducted by Jojo Velasco, who did Maritess Salientes’ composition and arrangement in MyRizal Jazz Symphony; and Gerard Salonga, the 2011 The Outstanding Young Men (TOYM) Awardee for Music, who jammed with Ms. Salientes for the finale number as a call to unity of all Filipinos for the love of country. Through the Cultural Center of the Philippines and the Society of Filipino Film Archivists, Gerardo de Leon’s 1961 adaptation of Noli Me Tangere was projected on the walls of Fort Santiago where Rizal spent his last days 115 years ago. Then, they launched the website at the Manila Diamond Hotel where they made a birthday cake with Maligayang Bati, Jose Rizal!, shaped in the form of the original design of Noli Me Tangere’s cover. What they started in 2011 reached its peak during the awarding ceremonies of PreMYo Rizal essay-writing contest at the Rizal Commercial Banking Corporation Plaza’s Yuchengco Museum last 5 December. The “new Rizals,” for Grade School (Filipino), include: Therese Diane S. Villanueva from Occidental Mindoro State College, first place; Jonalyn T. Juarez, Cantabaco Elementary School, Cantabaco, Toledo City, second place; Jaydie Ann R. De Castro, Paaralang Sentral ng Timog Boac, Laylay Boac, Marinduque, third place. For High School (English), the winners are Marisse T. Sonido, Assumption Antipolo, first place; Nicole Louise G. Serrano, Ramon Magsaysay Cubao High School, second place; and Jose Vergel T. Herrera, Saint Columban College, Pagadian City; third place. For College (Filipino): Teressa S. Villanueva, UP Diliman, first place; Jan Victor R. Mateo, UP Diliman, second place; Erick Dasig Aguilar, UP Diliman, third place; Roberto O. Umil, and Mon Karlo L. Mangaran, Far Eastern University, both honorable mention. On the other hand, College (English): Alexei Frederick Remollino Flores, UP Diliman, first place; Anne Margaret P. Cordero, UP Diliman, second place; Cristina Gratia T. Tangtengco, Ateneo de Manila University, third place. Vim Nadera: What is your project — My Rizal — all about? Lisa Bayot: Maite Gallego and I co-founded MyRizal composed of some descendants and friends of Rizal. It is a movement, an invitation and a challenge for all to rediscover Dr. Jose Rizal, have a deeper understanding of his heroism and ideals,and to celebrate the Rizal in each of us. MyRizal is inclusive and encourages participation by everyone—regardless of whether you are a Rizal relative or not–150 years after his birth. We have with us today his spirit, his example, his body of works. If Rizal lives in us, we can live Rizal. VN: What urged you to co-found it with Maite Gallego and Trixie Herbosa Grau? LB: We – together with Rosalyn Consing, Lois Ilustre, Miko Liwanag and Miles Po – are members of Binhi, an NGO I founded in 2008 advocating education for the youth, and Rizal embodies this quest for education. I thought we can match the ideals of both organizations for this purpose. Teodora Alonso is an “icon” of Binhi since our advocacy is education, and often, Binhi gets community-based mothers to teach Binhi classes. During Binhi parent orientation day, we point out Alonso’s significant influence on our national hero, and we point out opportunities to be a hero in one’s family and communities. VN: Last 19 January, you began another project. Whatever happened to Facebook Rizal 150 to 150? LB: In partnership with Holy Angel University in Pampanga, we launched Facebook Rizal 150 to 150, a daily countdown 150 days before 19 Jun 2011. Each day featured a different quote from Rizal set against the backdrop of a different Rizal monument in various parts of the country. It ended when we reached countdown zero. VN: Later on May 28, Ms. Herbosa presented Rizal to the Museo Pambata as a Young Hero for the Filipino Child, could you tell us the details? LB: At Museo Pambata, my cousin Trixe Herbosa Grau and I, together with volunteer Marie Ganal, highlighted Rizal as a young person so that Filipino children can better relate with Rizal and appreciate him as a hero. We showed how he lived his life as a son, brother and a student by narrating stories of Rizal growing up as a normal boy, undergoing the same experiences that other children do. We recounted how much effort he exerted to excel in sports, how he enjoyed clay modeling and sketching, and his mother’s influence on his early learning. VN: During the 150th birth anniversary of Jose Rizal last 19 June, you organized Maligayang Bati Jose Rizal at the Fort Santiago. How was it? LB: My Rizal was honored to be working with and collaborating with different groups. These participants joined enthusiastically and volunteered their time and efforts out of their nationalism. In spite of the rain, 600 people attended and it generated the highest turnout ever of Rizal descendants in a family reunion. VN: You honored the PreMYo Rizal winners last 5 December at the Yuchengco Museum. What lessons did you learn from it? LB: We visited schools and DepEd school conferences to promote PreMYo Rizal. We were inspired and encouraged by the enthusiastic reception we were shown in many places and by the support we have been given by government officials, our media partners and our sponsors. Rizal is a unifying force for our country. He appeals to the hearts and minds of Filipinos of all ages. We were also touched by the unique perspectives and the local contextualization of Rizal that we read from the essays. We learned that we mustn’t take our children’s thoughts and feelings for granted: they do have surprisingly distinctive views and questions which we must encourage, harness, guide and answer wisely. VN: You are also the founder and chairman of the Binhi English Literacy Foundation Inc.? Tell us more about its history. LB: Binhi is a non-profit foundation inspired by Pratham which has promoted literacy and the learning capabilities of 21 million underprivileged children in India. I founded Binhi in 2008, with our vision of “Every Filipino child in school and Learning Well.” We started with pilot classes at the HSBC library in Baseco, Tondo . Today, more than a thousand children have been helped through Binhi classes. We target children who are at risk of not completing an education. It is Binhi’s desire to see all Filipino children develop reading and writing skills as a foundation for their education. Binhi provides a teaching/learning kit comprised of a daily lesson plan for six months, flash cards, board games, 53 story books, instructional DVD, evaluation tests, application forms and monitoring sheets. MyRizal is a program of the Binhi English Literacy Foundation Inc.
VN: Do you work hand in hand with the government? Or with the church? LB: Yes, presently there are 12 Binhi classes at five public schools in Pasig and Laguna comprising 363 students. 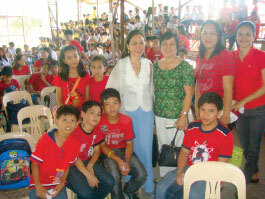 One of its sites was initiated by sponsors who are active in their parish and Binhi classes were held in a chapel. VN: What were the sites you selected and why? Binhi’s strategy is to obtain community sponsors who will purchase the teaching/learning kit, and recruit the teachers (who may be community based mothers rather than trained teachers) to teach the classes. The community sponsors also handle student recruitment and evaluation testing. Therefore, we go to sites where we find community sponsors. VN: What are your plans for this year and beyond? LB: Today more than a thousand children have benefited from the Binhi kit which provides them with the necessary learning tools needed to stay in school. We hope that as they stay in school and complete their education, they will become productive and financially independent citizens. Effectively, we see Binhi as a stepping stone to escaping poverty. Binhi is developing two more Learning kits, one to teach Pre-Reading to pre-school children, ages three to five and another for older children, ages nine to 11 who have Basic Reading skills. MyRizal will continue its focus on education, culture and the arts. We are in talks with the DepEd to assist them in promoting public awareness and interest in some of their Rizal related activities. We will encourage new research on Rizal, his family, friends and our other national heroes who in the coming years will also be celebrating their sesquicentennials.